These are the official prices of La Belle Maison rooms and meals per person. All our prices include a continental breakfast! 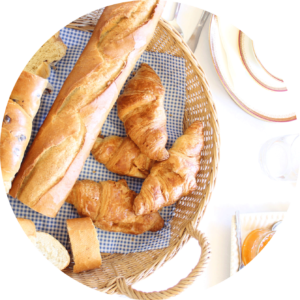 You can also find La Belle Maison’s breakfast hours, checking in hours and checking out hours here too. With notification, La Belle Maison can cater for special diets (gluten free, sugar free, vegan and dairy free). Tax de sejour is 0.30euro per person/night. If you are in need of visiting outside of La Belle Maison’s hours, do feel free to get in contact with us via email or call us. Giving La Belle Maison a time of arrival can help us prepare everything for you. We ask you kindly that you request before 10:00 hours should you need an evening meal. La Belle Maison will provide you with a three course meal when requested. Meals are only provided during the off season time when local restaurants are closed or open with limited schedules.